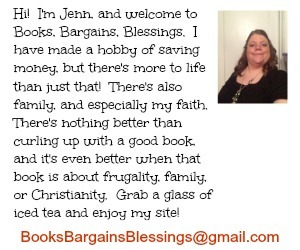 Books, Bargains, Blessings: Thanks GIVING! I mentioned in a previous post that I'm participating in the 30 day giving challenge. One of the ways I love to give is by getting free stuff either through sweepstakes or using coupons and being able to give them away. I know some people won't ask for help when they can use it, so I try to give directly as well as many times through organizations who provide Christmas gifts and such to children. A few years ago I was able to buy $1700 of games for $65. They went to a few different organziations for raffle items to help them raise money ("Family Fun Night" baskets). I gave some to a friend who didn't have the money to buy much for her children for Christmas. (Se nearly cried as she left with about $200 of stuff. My cost was about $5.) When I see a good deal, I jump on it. Did I need all those games? No. But someone could use them. That I knew. Same with the cereal deal I did last week. I was amazed at the number of people who asked me what I was going to do with all that! Food banks are really hurting right now. In fact, to encourage giving, the West Virginia lottery is doing a "Give and Win" food drive. They do this nearly every year. November 10, 2010 if you take a non-perishable food item into certain lottery retailers you'll receive a free instant scratch-off lottery ticket. You can see the list of places HERE. It think it's a cool idea to raise awareness of food banks! The only thing I often get free I can't figure a place to donate is over the counter medicines. I can give them to people I know, but other places won't accept them. Toilet paper: churches, schools, Christian camps, homeless shelters, food banks, etc. Let's see how you can GIVE this week! Like I said, it doesn't need to be something that costs money! I don't know about where you live hon, but here in Virginia there are area churches that have small food pantry services and they accept over the counter medicines. I've picked up Tylenol and Benadryl and things like that there before. You might want to check with the churches in your area. Visiting you via 30 day challenge. I agree with giving free time. My sister is a single mom. That is the greatest gift anyone can give her, is their time.